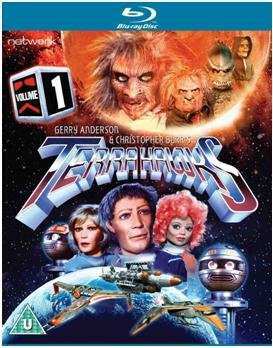 THE CLASSIC British children’s sci-fi series from the legendary creator of Thunderbirds; Terrahawks is to be released on Blu-ray and DVD courtesy of Network Distributing. Terrahawks: Volume 1 (U) will feature the first 13 episodes, presented for the first time in High Definition from the best available materials, in their original as-transmitted aspect ratio. It will be available to own from 25 July 2016 on Blu-ray and DVD, each RRP £19.99. Gerry Anderson, the hugely influential creator of Thunderbirds, Captain Scarlet and Space: 1999 made a spectacular return to puppet animation in the early 1980s with an exciting new series co-created with Christopher Burr. Thrilling yet another generation of children (and adults! ), Terrahawks introduced a new elite force to defend 21st century Earth against a host of alien invaders. Led by the heroic Tiger Ninestein, the Terrahawks crew consists of Captain Mary Falconer, his acting second-in-command; fighter-pilot and former pop star Kate Kestrel; the poetically inclined Lieutenant Hiro; and Lt. Hawkeye – the gunner with computer-enhanced vision. Assisted by a legion of charismatic spherical robots known as the Zeroids, they battle a cabal of evil adversaries – none more terrifying than android crone Zelda, the would-be conqueror of all "Earth-Scum"! This to me was the most strangest of all of Gerry Andersons creations, and yet he created some brilliant stuff like four feather falls, Supercar, my favorite Fireball XL5, Joe 90, Thunderbirds p[us the lot you mentioned, etc . I do not know if he was on drugs, speed or weed at the time, but the characters and content was so strange for a kids show, it all seemed a bit disjointed, but it worked. I used to find my kids terrified by the show, especially seeing Zelda, what a frightening character. One redeeming quality were the Zeroids which were quite comical in their way. We used to laugh a lot at therm. i do not know what it is about kids shows that they keep coming back for some more terror, as they loved it even though they had to hide their faces sometimes behind a cushion (Doctor Who style). All my kids have grown up now, youngest is a late teenager, but must ask my oldest ones who are married with kids, if they would want to show Terorhalks to their kids nowadays. Just got a feeling this show is a bit dated, along with four feather falls and Supercar, compaired to Anderson's other stuff. Thunderbirds, etc.